We survived our first trip as a family of four! This trip was planned shortly before I knew I was pregnant with Ava. My older sister, got engaged and chose a wedding venue in the beautiful mountains of Chattanooga, Tennessee. Of course when I found out my due date March 23rd, I was relieved it was exactly a month before the wedding and not on E’s actual wedding day. The timing was perfect, but my whole pregnancy I was mentally preparing to travel with a one month old. Ava’s first vacation started on Friday, April 20, 2018. She was 4 weeks 6 days old. We made is through our first flight on South West Air. Of course we had tons of luggage, no minimal packing here. We hauled a toddler, an infant, a stroller, 2 car seats, 3 bags, a diaper bag, and a tuxedo, MOH dress, and flower girl dress. ~ PRO TIP: Have the hubby drop you, the kids, and the luggage at the front of the airport, while he parks the car. We learned the hard way the first time. Two year olds are painfully slow while walking from the parking lot to the front. And no one could carry her with all of the luggage. Another thing that made traveling through the airport 100% easier was babywearing. Everyone knows I’m a huge fan of babywearing. I alternate between my Solly Baby Wrap and my Sakura Bloom Ring Sling. On this trip, I loved using my Solly Baby Wrap while exploring the Aquarium, Zoo and the different parts of Nashville because it was easier to shade my baby’s head from the sun and the rain. I pulled out my ring sling for babywearing at the wedding because it was a little fancier. Both are cozy and share the same baby wearing benefits. It is also a preference, some babies and mamas prefer one over the other. I choose mine depending on what I’m doing. My babies seem to be comfortable in either one. For more information on babywearing and it’s benefits, read this. Once we got to Chattanooga, we were super busy. I was the MOH, but also did E’s wedding hair and makeup. Although, non stop busy – just call me, mommy, MOH, hairstylist/makeup artist, or Sister of the Bride – we had a blast celebrating Emily and Ryan at their wedding with family and friends. It was really amazing seeing everyone, and all of the hard work and plans came together so beautifully. ~ PRO TIP: just leave the baby and two year old with a babysitter and enjoy date night with the hubby. Zoe was suppose to be the flower girl, but honestly it was just too much for her. Good thing my mother-in-law was there as “babysitter” and came to the rescue! Chattanooga is a really great area, which had tons of fun restaurants and shopping. Our favorite part (besides the wedding), was visiting the Aquarium. I would love to go back to Chattanooga and explore a little more. The hiking trails are suppose to be incredible. Once all of the wedding festivities were completed, we headed to Nashville. A couple of years back I ran the Nashville Country Music Half Marathon. So Nashville wasn’t new to me. However, the food scene was pretty amazing and I had more time to explore some other neighborhoods. When it came to the food, Hot Chicken and BBQ are the specialties of the area, however there were tons of juice bars. Some of my favorite things were the Thai Peanut ice cream and the donuts from Five Sisters. Nashville also has some pretty incredible street art. We went to “WhatLifts You” wings by Kelsey Montague. And the “I Believe in Nashville” street art posted above. We enjoyed a little bit of the music scene by walking around in down town Nashville. And on our last day, we took a family trip to the Zoo. All in all, we love both Chattanooga and Nashville! You’ll always hold a special place in my heart for being Ava’s very first vacation spot! She is such a great little traveler at just a month old. What’s your favorite thing about Nashville? Have you traveled with an infant… what’s your pro tip? 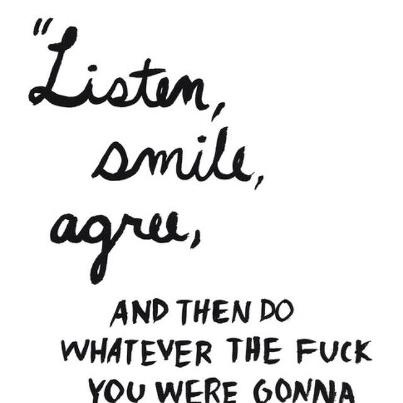 What great advice… It is that simple.